Yes, you read that right; Cycle & Carriage Bintang Berhad turns 120 years old in 2019 and that’s nothing short of astounding for a local brand that began in Kuala Lumpur back in 1899. Today, Cycle & Carriage is a leading regional automotive group in with 10 brands operating in Malaysia, Singapore and Myanmar. 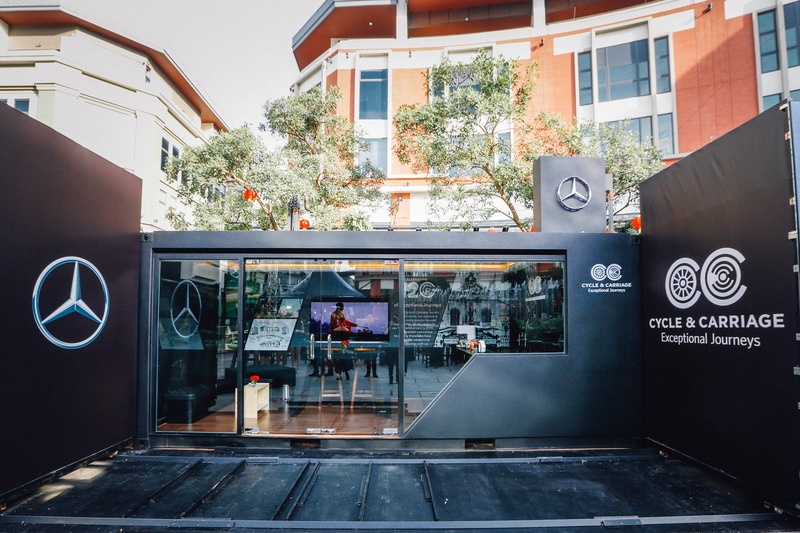 To celebrate this milestone, Cycle & Carriage will be hitting up a number of locations around the country in its Mercedes-Benz Star Galleria mobile showroom housed within a snazzy container. The container will hit up multiple locations across the country that aren’t proximate to a Mercedes-Benz Autohaus centre; basically towns that don’t have a permanent showroom. The 20.0ft x 8.0ft container is easily recognisable with Mercedes-Benz logos and design. It also features Wi-Fi, a refreshment stand and in-built digital devices to facilitate consultations for customers to learn about new offers as well as financing and insurance solutions to facilitate the ownership experience. Test drives will be made available as well by the team of Cycle & Carriage sales executives and product experts that will be manning the mobile showroom. Cycle & Carriage has an extensive network presence of 13 outlets across Malaysia that includes three ‘Centre of Competence’ body and paint collision repair facilities in Batu Caves, Bukit Tengah and Johor Bahru that are certified by Mercedes-Benz. Furthermore, Cycle & Carriage was recently awarded at the 2018 inaugural Mercedes-Benz Malaysia Dealer of the Year awards for its top notch aftersales service and customer service and loyalty. In continuing its commitment to customer service, the company also launched Malaysia’s very first Mercedes-Benz Star Mobile service that brings maintenance to the customer’s doorstep. In conjunction with the 120-year celebration, Cycle & Carriage also launched a regional campaign to give away 120 exceptional journeys of specially curated trips to three destinations; Mongolia, Nepal and Korea. The campaign runs from 10 January to 30 November 2019 and is open to customers in Singapore, Malaysia and Myanmar. More information can be found here. As for the trips, they represent an immersive societal experience for each destination. Mongolia’s theme is “Adventure” and it includes journeys across the rolling steppes and living in nomadic settlements that have called the grasslands home since the time of Genghis Khan. You’ll get to soak up the wild splendour of the Mongol Els sand dunes, visit the Hustai National Park to get acquainted with the takhi, the world's last wild horses, and connect with a local Mongolian family to experience the nomadic lifestyle first-hand. As for Nepal, it’ll be all about “Culture” so be prepared to immerse yourself in the history of Kathmandu and find out why this ancient kingdom is also one of the most enchanting places on earth. Visit sites such as Pashupatinath; a Hindu temple complex and Unesco World Heritage site, journey to the mountain village of Nagarkot and admire the Himalayas from an altitude of 2,200m as well as venture into the Kathmandu Valley and uncover its stunning views. If something more urban is your thing, Korea and its “Metropolis” theme will see you step out in style in Asia’s capital of cool and embark on an urban odyssey across Seoul to discover its thrills, sights and sounds. Experiences include the famous guard-changing ceremony at Gyeongbokgung Palace, a stroll through the Bukchon Hanok Village that’s the setting for scenes from popular K-dramas and learn to prepare an authentic Korean meal.